Today is the first perfect fall day we've had all year, and let me tell you what...here in South Carolina, we deserve a perfect fall day. I've said this time and time before, but I will never adjust to the heat and humidity that comes with southern summers. Same with my hair. So you'd think I would be spending this perfect day wearing a jean jacket and wandering around some apple orchard, but I've settled for re-runs of the Housewives of Atlanta. I did, however, make up for my lack of fall spirit with this pie. That's where I'm at in life. Peel, cut and core apples. 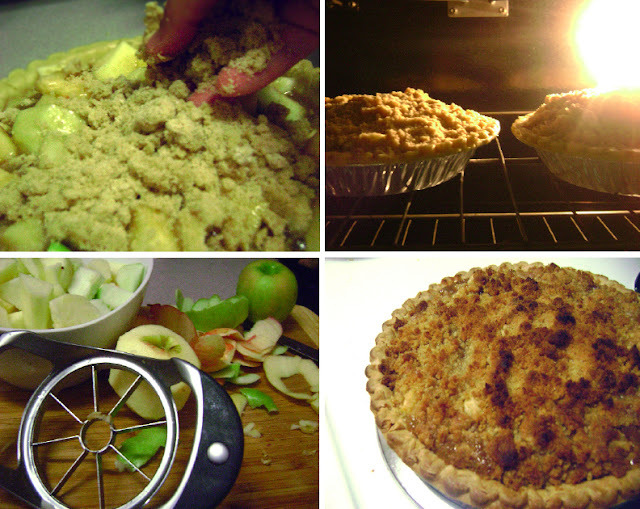 Place in pie crust. In a medium sauce pan, melt butter. Add the rest of the pie ingredients and stir. Bring to a boil. Pour filling evenly over apples in pie crust. In a medium bowl-and using hands-combine all three ingredients until it's a nice, crumbly mixture. Top pies generously with crumb topping. Bake at 350 for 35-40 minutes until crumble topping is golden brown. It's really much simpler than it looks at first glance, especially if you buy store-bought crust. Serve warm with cinnamon ice cream and enjoy!